June 10, 5pm – Performing solo accordion music in Bryant Park, NYC as part of the Accordions Around the World Festival. June 21, 2pm, 5pm– Performing solo accordion at 2pm and quartet music at 5pm in City Hall Park, NYC. Classical, jazz, contemporary music, and more – with Robert Duncan, Mayumi Miyaoka, and Denise Koncelik as part of the Make Music NY day. July 15, 5pm – back in Bryant Park again playing more accordion quartet music with Mayumi Miyaoka, Robert Duncan, and Denise Koncelik as part of the Accordions Around the World Festival. Aug 1-3, 7pm each day – Performing on William Schimmel’s Master Class and Concert Series 2014 at the Tenri Cultural Institute. I’ll be doing several solo performances including a new composition of my own, Paganini’s In There Somewhere, as well as some ragtime accordion and a classic work by Carmelo Pino. Sept 9 – Official release on Naxos Records of Oberlin Conservatory’s recording of my piece for piano and electronics, ElectroSonata:Spontaneous Combustion, performed by the incredible Thomas Rosenkranz. Available in Blue-Ray surround as well as stereo! Late Sept 2014 – Working a new piece for violin and piano to be premiered by Gregory Fulkerson; based on afro-Cubans rhythms inspired by Peter’s recent professional research trip to Havana, Cuba with the American Composers Forum. Performances in Ohio, Delaware, and (hopefully) NYC. Thanks for your interest! Hope to see you at a performance soon! Sheetflow Songs – “Halfway” from Peter Flint/Avian Orchestra on Vimeo. TICKETS: General admission tickets are available for $15 in advance, $20 at the door. On Friday, Sept. 20th, 2013, Ben Kaplan and I will present a special live performance of Sheetflow Songs, our extended song cycle without words for accordion, electric guitar, electronics, and video. In addition, the program will open with a set of music by pianist/composer Andrew Shapiro with violinist Gregory Fulkerson. 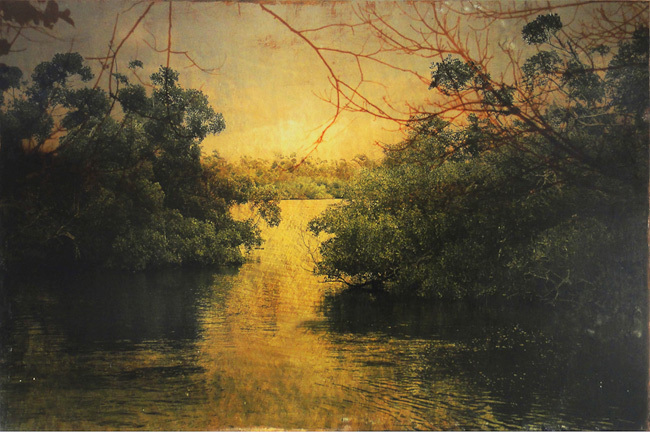 For the past several months, guitarist Ben Kaplan and I have been collaboratively composing music inspired by Dorthothy Simpson Krause’s gorgeous series of photographs of the Everglades, entitled River of Grass. On June 22 at 7:30pm, we will be performing the fruits of our labors in the presence of the artwork at 571 Projects in Chelsea, NYC. I will be playing accordion with electronics while Ben will be performing on guitar and synthesizer. “Sheetflow” is a term referring to the broad wide slow flow of water through the Everglades, and in a loose way our music mirrors this slow massive flowing. For Ben, whose background is in post-metal music and for me, coming from a classical tradition, this is a significant stylistic departure that takes us both into new and unexpected musical territory. This short set of wordless songs is our only scheduled performance of this music at the moment so don’t miss this chance to hear it! 571 Projects is a lovely pocket-sized art gallery in Chelsea in just about the last building of artists studios left in Manhattan. Unfortunately this is the last show at this gallery as the building is slated to be torn down in September to make way for more luxury condos. Gallery owner, Sophie Brechu West, has really poured her heart and soul into the place. Please come out and show your support for the space, the art and the music at this one of a kind event. But space is limited so please RSVP to [email protected] so we have a rough headcount and enough seating in place. The Avian Orchestra returned this fall with a lush new program of music about plants. World premieres from Bret Battey, Max Duykers, Peter Flint, and Jonathan Newman as well as new arrangements for the group by Michael Gandolfi from his acclaimed symphony The Garden of Cosmic Speculation. The orchestra performinged against a backdrop of video created by the composers with other collaborators. An evening of fun, progressive, and approachable new music with something for everyone. Bret Battey-Clonal Colonies preview from Peter Flint/Avian Orchestra on Vimeo. The John Brown Cycle (2005, 20′) for soprano, tenor, bass/baritone w/ piano or chamber ensemble is preview excerpt from Peter Flint’s forthcoming opera about the abolitionist John Brown. Purged By Blood: an internet opera will be released in serialized form, hopefully soon. Peter Flint, assisted by Avian Orchestra musicians Arash Amini (cello) and Alfonso Sturgeon (woodwinds), will premiere new music for his accordion trio at the intimate 571Projects gallery in Chelsea. Expect a quirky and engaging musical evening surrounded by edgy contemporary art as Peter puts his new-found accordion skills to the test and delves into new creative territory. Eileen Grycky and Christiaan Taggart will be premiering my newest piece, Double Speaking, which is loosely inspired by some of the Latin American folk music I have been immersed in recently. It’s a virtuosic and fun composition. I’m completely looking forward to hearing them grapple with it!